I am starting a new column devoted to women of style. In the initial stages of my column, I will profile society ladies who pursue philanthropic endeavors but are also fashion standouts. I will be covering their hectic lifestyles, interesting fashion choices and philanthropic endeavors. I always was curious as to what designers these ladies wear, who their fashion icons are, and what type of effort they make in getting dressed. Eventually, I would like to expand the column to include entertainment figures, fashion leaders and those who astound with their brave and interesting sartorial garb. Some have the means to purchase couture while others have the creativity to look like they purchase couture; both of these prototypes are interesting subjects. The column will explore the ideology behind getting dressed. As a woman, I know how clothing mirrors my attitude, mood and disposition. I will be exploring this phenomenon with the personalities I write about. This is a column about that small segment of society that likes to make a statement with the clothing they choose; those who are not afraid to wear white in the winter or boots in the summer. 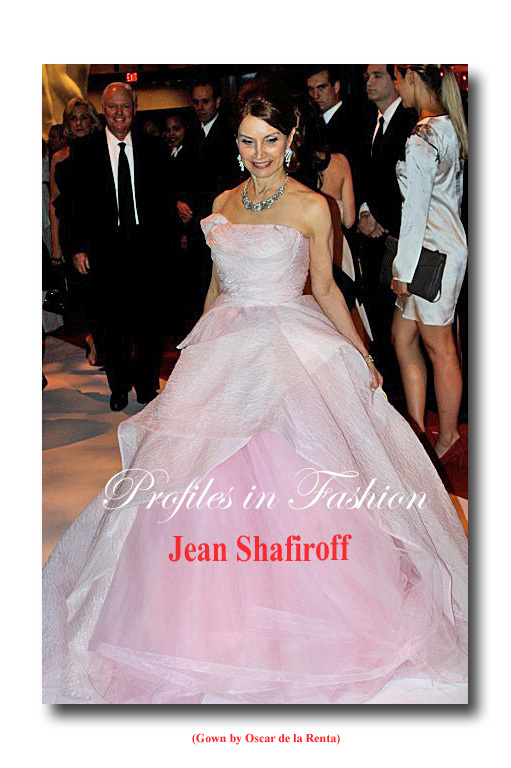 Jean Shafiroff is one of those who understand that fashion rules precisely because there are no rules. Who will be the next Donna, Marc, Francisco, Narciso? If you were at Pier Sixty, Chelsea Piers Wednesday evening, you may have a pretty good idea. Parsons, The New School for Design, http://www.newschool.edu/parsons/, a revered institution known for churning out some of the most formidable talent on the planet (including the aforementioned names), held its annual Fashion Benefit on Wednesday evening. This year, the honorees were Parsons alumni Jack McCollough and Lazaro Hernandez of Proenza Schouler, and Bonnie Brooks, President of the Hudson's Bay Company, for their contributions to Parsons, the fashion industry, and philanthropy. Funds raised at this benefit, which is now in its 65th year, are used for scholarships. During the course of the evening, Parsons Executive Dean Joel Towers made the announcement that this year, nearly $1.7 million had been raised. ﻿ The popular event space, situated directly on the Hudson River with floor to ceiling windows, could not have been more perfect, given the summer like weather, and it was maximized to full tilt. While it was fashion gridlock inside, guests including Beth Rudin de Woody, Parsons Trustee; Kay Unger, Incoming Board Chair, Parsons; Bridget Foley; Sally Singer; Hamish Bowles; Margaret Hayes; Steven Kolb; Julie Gilhart; Mickey Boardman; Michael Vollbracht; Olivier Theyskens; Christian Siriano; Parsons alumni Reed Krakoff, Tracy Reese, Narciso Rodriguez, Prabal Gurung, Carly Chusnie, Michele Ochs, and Patrick Robinson mingled about. A vast room leading out to the terrace - where many enjoyed their cocktails watching the boats go by - was transformed into the ultimate showroom, with a well edited, highly visual, and compelling selection of some of the graduating students' collections (clothing and accessories) on display. 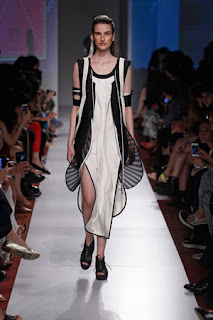 Among those that caught my eye: Wei Ng's beautiful white dress with a painterly abstract design in orange and black, and a sculptural black coat; Hyun Jung Yoo's and Sumaiyah Akhtar's minimal and architectural designs in black and white; and Jung Yun Park's graphic designs in Saga mink. A highlight of the event is always the runway show of select collections by graduating students, and the naming of the Designers of the Year. In 2002, McCollough and Hernandez received this honor, as did Marc Jacobs in his graduating year, so I guess one can say this is a pretty good barometer of future success and star status. This year’s recipients were Womenswear Designers of the Year Harim Jung from Seoul, South Korea, and Kaye Applewaite from Barbados; Menswear Designer of the Year Yunxiang Sharon Zhou from Tai’An, China; and Childrenswear Designer of the Year Diana Flavio Woodside from Los Angeles. Opening Exhibition of Museum at FIT: "RetroSpective"
We all know that everything old is new again, borrowing is nothing new, and history always repeats itself; especially where fashion is concerned. But that doesn't mean those elements do not make for a worthwhile, informative, and highly visual fashion exhibition. To wit, "RetroSpective", on view at The Museum at FIT, May 22, 2013 - November 16, 2013. This exhibition examines fashion's fascination with its own history; it illustrates the way in which designers are inspired by historical silhouettes; and most importantly, the way they "use past trends as a point of reference — adapting and interpreting them in order to modernize historical silhouettes and details". It is comprised of 100 garments, accessories, and textiles, features a small selection of garments inspired by ancient civilizations including Egypt and Greece, in addition to particular eras in history such as the Middle Ages, and the remainder features period fashions beginning with the 18th century, paired with their more recent revivals. Yesterday morning, I attended the press preview during which time the curator, Jennifer Farley, was present to answer questions. She explained that it is in semi chronological order beginning with the 18th century, and ending with grunge and punk. We can't seem to get away from grunge and punk these days, can we?! From beginning to end, within the multi media installation, there are compelling examples which illustrate a number of themes. We can see how designers have been inspired by ancient Greece and Egypt. A Norell mermaid dress with a bejeweled collar, 1971, is displayed next to a Madame Gres pleated Grecian style column from 1949 column, and a jeweled Yves Saint Laurent evening dress, 1966, that recalled the Byzantine empire. The art deco, flapper-esque 20's, which could not be more 'of the moment' thanks to the recent release of 'The Great Gatsby', are represented by a group of dresses by Lenief Couture,1925, Dior,1961, Norell, 1965, Ozbek, 1986, and Carolyne Roehm, 1988, as well as cloche hats dating from 1929 - 1999. The strong tailoring of the 40's (chic jackets with nipped in waists by such as Bill Blass and Saint Laurent) are standing next to the youthful if not risque for their times hot pants that defined the 70's (in the case of the latter, a non labeled play suit from 1938 was displayed next to an Ayaka vest and hot pants from 1970, and a Katherine Hamnett ensemble from 1993). An ethereal Pierre Balmain silk, organdy, net, and nylon gown, 1948 was placed next to a Marc Jacobs evening dress from 2008, and indeed, it was hard to tell which was which. And in a season when grunge and punk are on everyone's minds (I almost want to say 'enough' already LOL), the show closes with some good examples (I guess the Costume Institute did not get them all): a suit by Mike Bidlo,1982; a graffiti printed dress by Balenciaga by Nicolas Guesquiere, 2004; Stephen Sprouse's graffiti printed leggings, 1985; an Anna Sui ensemble, 1993; and Dries Van Noten's chic grunge plaid two piece, from 2013. But hands down the most highly visual grouping was to be found smack dab in the middle of the exhibit: a display consisting of the exaggerated shapes of bustles, cage crinolines, corsets, bustiers, and panniers. Not surprising, when I asked Ms. Farley, who observed that the focus of the exhibit was on shape and silhouette, what her favorite part of the exhibit is, she led me straight to this area. She perfectly illustrated her point by juxtaposing an authentic metal and wire bustle dress form by Hall Bustle and Hall Corchert, 1887, next to an Anna Sui ensemble, 1999-2000, a Carolina Herrera cocktail dress, 1988, and a Schiaparelli gown, all with bustles in one form or another. Across the aisle, two short dresses with exaggeratedly full skirts by Lanvin, 1923, and Agatha Ruiz de la Prada, 2009, were beside a traditional robe a l'anglaise, 1765, and a long gown by Balmain, 1951. Perhaps most compelling was the installation comprised of a collapsible skirt hoop from 1950; a divine Hoshiki Hishinuma die dye evening dress, 1996, with an exaggeratedly full skirt inspired by cage crinolines found in the mid 19th century; a full skirted and corseted Olivier Theyskens for Rochas wedding gown; and her favorite outfit (and the hands down show stopper) Thom Browne's madras plaid pantsuit with an architectural cage crinoline on the outside, from fall 2013. FYI, Ms. Farley herself, chose a lovely vintage dress with a small floral print for the occasion, and not a dress with a bustle or panier. 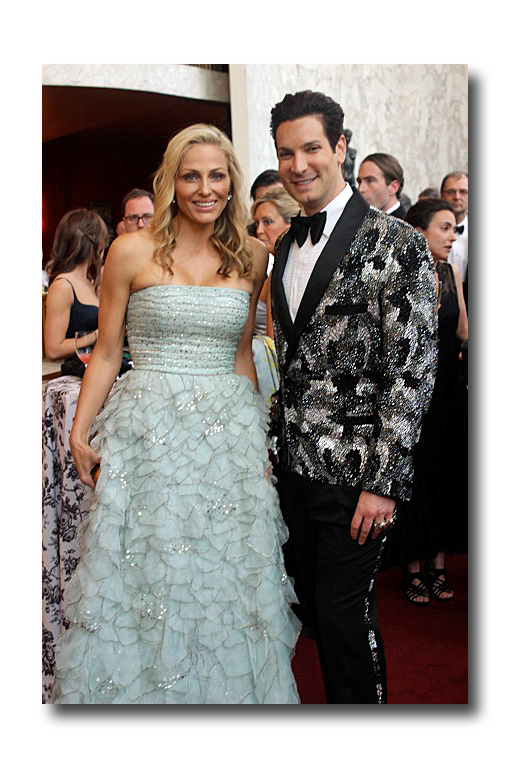 ABT held its annual Spring gala at the Metropolitan Opera House a week after the Costume Institute Gala took place. One thing is for sure, punk is not the new trend -- the ladies were dressed elegantly in full length gowns, heavy jewelry, with bright colors making a big comeback. This event is my favorite soiree of the year. Kevin McKenzie, the artistic director, always puts on such an exciting performance; he literally transforms classically trained dancers into full on acrobats with ornate costumes, great orchestral music, and exciting showmanship. As a former ballet dancer at the Joffrey School of Ballet, I enjoy the American Ballet Theatre dancers because they are technically masterful; with so many guest dancers from the Russian Mariinsky Ballet this event is hard to resist. The crowd was comprised of celebrities such as Lucy Liu, Christine Baranski and Ashlee Simpson, socialites Blaine Trump, Julia Koch and many others, models Chanel Iman, Coco Rocha and Alek Wek and designers such as Zang Toi and Dennis Basso. There were ladies in stripes, ladies in white, and ladies in pastels. My two favorites of the night were Lucy Liu, in an elegant white Vivienne Westwood gown and Jamie Tisch in a pale green Oscar de la Renta confection. The event was sponsored by Dior with Michelle Obama, Caroline Kennedy and Blaine Trump as the honorary chairs. Unfortunately, Obama and Kennedy were nowhere in sight. The ballet featured small vignettes of ballets that would be shown over the next eight weeks to give the audience a taste of what to expect. This is a clever ploy as it whets the audience's appetite for the approaching season. Another regular feature of this gala is the performance of up and coming dance stars of the Jacqueline Kennedy Onassis School. This allows the young dancers to experience being in front of a gala packed audience at a fledgling age. The simplicity of the student's movements was enhanced by their plain blue leotards allowing the audience to focus on the intricacy of their repartee. 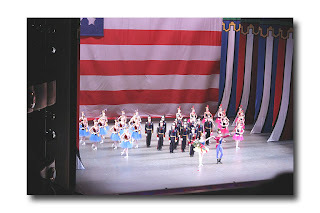 The coordination of the men's and women's costumes for the other acts in the ballet was perfection with the men mirroring and complementing the colors in the women's outfits providing a harmonious coupling. ﻿﻿﻿﻿﻿Lately, I have noticed men stepping up their fashion game with little recognition from the media. Cameron Silver, owner of the vintage clothing line Decades, was there in a vintage Versace tuxedo embellished with diamonds, sparkles and a wild animal print. He said, "I skipped the Costume Gala this year for the first time in six years and I am glad. The Costume Institute theme went against the grain of the Gala which is the antithesis of punk-the Gala is all about elegance and beauty-it just did not fit." Prince Dimitri of Yugoslavia, was elegant and appropriately aristocratic in a custom made long jacketed tuxedo with studded buttons from his own jewelry collection. Zang Toi showed up in a white skirt and tuxedo jacket with black tights. These men deserve plaudits for their risky and effective fashion choices. Another fashion iconoclast, Suzanne Bartsch, sported a black Mohawk with ripped pants and heavy black makeup - so I guess there are some punks at the ballet. At the conclusion of the ballet, the star studded crowd replete with numerous photographers snapping their pictures, made their way to the lavishly adorned tent for dinner and dancing. As Sigourney Weaver said at the beginning of the night, "Spring has not arrived until the ABT Spring gala happens". If this ballet is a harbinger of the season to come, then Spring should be a triumphant return to the elegance of the past. 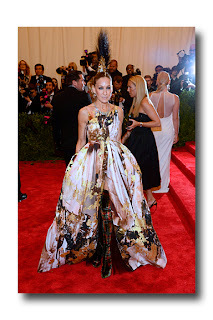 In the minutes, hours, and days following the Met's Costume Institute Gala on Monday night, there was non stop, never ending coverage: on line, in the newspapers and glossies, and on television (news and entertainment segments). 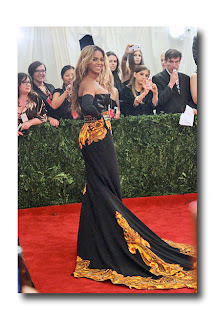 And, of course, there was live video streaming of the red carpet arrivals, courtesy www.vogue.com, www.modaoperandi.com, and the www.metmuseum.org . But, let's face it, there's coverage and then there's COVERAGE. 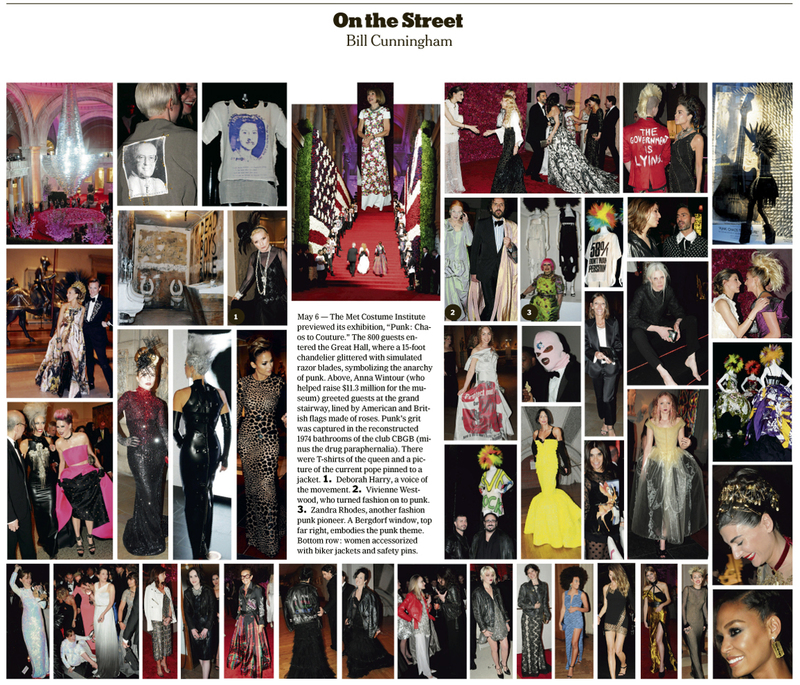 I would venture to say that for most "in the know" fashion insiders, it is Bill Cunningham who has the last word. He is respected as a highly influential iconic figure with an unwavering knowledge of fashion history, the social hierarchy, and a well trained eye. 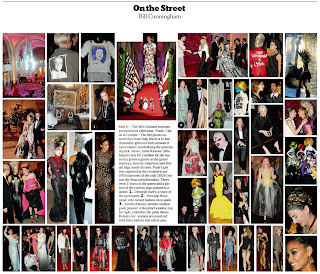 His On the Street column, which appeared in today's Sunday Styles section of The New York Times, was almost one full week after the opening of "Punk: Chaos to Couture" and "hopefully" formally puts an end to any mention of the event until next year. Yes, we've all been barraged by the same images of SJP (Sarah Jessica Parker), J-Lo, Gio (Giovanna Battaglia), Ha-Bo (Hamish Bowles), Ca-Ro (Carine Roitfeld), et. al. But Bill's editorial pictorial essays are always highly visual and informative, and he always makes sure to give credit where credit is due: singling out those who matter. In this case, he included images of Deborah Harry (who he described as "a voice of the moment"), Vivienne Westwood ("who turned fashion on to punk"), and Zandra Rhodes, ("another fashion punk pioneer"). And of course, the Queen Bee herself (no, not Beyoncé clad in yet another ridiculously ostentatious gown with never a ending train), but Anna Wintour, who helped raise $11.3 million for the museum and greeted guests at the grand stairway, lined by American and British flags made of roses. Undeniably, her considerable muscle and unfailing passion has helped to make this event one of the most high profile and eagerly anticipated on the calendar. Anna looked, well, just like Anna. Her hair was in that perfect not-one-hair-out-of-place bob, and her dress just about as conspicuously "un punk" as one can get. She wore an elegant and lovely white Chanel Haute Couture creation covered in flowers. Whether or not her choice was deliberate (duh! ), she was definitely making a statement. It was as if she was saying: "You didn't really think I was going to wear punk do you? Don't be silly. I can wear whatever I chose. I'm above it all". And she is. What do you get when a seasoned, third generation furrier combines her passion for and knowledge of furs, her technical know-how, her love affair with vintage, her understanding of today’s fashion and lifestyle, her discerning and uncompromising eye, her innately good taste, her always meticulous attention to detail, her need to be creative, and a desire to transform fur? Anne Dee Goldin's new business venture of course. 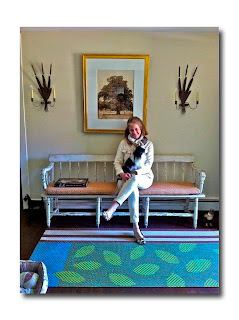 Anne Dee's fresh approach and strong aesthetic vision attracted some of the world's most influential designers including Chloe, Anne Klein, Geoffrey Beene, and Narciso Rodriguez (not too shabby), to create their fur collections which were sold worldwide. She was also responsible for groundbreaking ad campaigns selecting "up and coming" advertising talents such as Peter Arnell, Neil Kraft and Doug Lloyd, now all legendary in their field. The ads were shot by famed photographers Arthur Elgort, Rico Puhlman, Herb Ritts and Patrick Demarchelier featuring the hottest models in the biz wearing the coolest furs with clever tongue-in-cheek copy written by Glenn O’Brien. In retrospect, Anne Dee takes pride in her ability to spot fresh talent and is honored to have had the opportunity to work with them. Enough of the name-dropping. In 2000, she launched her eponymous collection, Anne Dee Goldin New York which was hailed as a welcomed, much needed, modern vision and voice within the fur market. "It" was no longer about the "Fur Coat". Inspired by fashion from past decades her pieces: stoles, boleros, shrugs, capelets, cropped jackets, hats, scarves and (yes) coats made out of mink, fox, rabbit and her favorite, "farm animals": lamb, goat and calf, reflected her sense that fur was to become a part of a woman’s everyday wardrobe. Women in-the-know flocked to her showroom, fashion forward stores vied for exclusives in their areas and her furs were featured in fashion editorials in the top magazines. Goldin decided to shutter that business in 2006 opting for a less hectic life. In response to her private clients’ requests, she immediately launched GoldinStyle: Fine Fur Storage and Services as the solution to maintaining and caring for her customers' furs. Right from the start Anne Dee was lured back into the business as her clients reached out to her for new furs items as well as to update (remodel) furs of their own. The person who had been on everyone’s "fur" lips had now become the best kept fur secret. Anne Dee was doing what she loved the most: the creative hands-on process and the pleasure of working one-on-one with the end wearer. 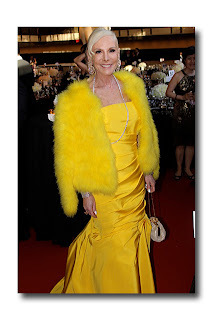 I had written an article about GoldinStyle about six years ago then Anne Dee and I kind of lost touch. When I recently received a postcard from GoldinStyle, I was intrigued and decided to check in with her. What I discovered, was that in the past few years, her "little business" as she refers to it (as opposed to the "Big Goldin Feldman") had taken on a life of its own. Solely by word of mouth or by those who did a ‘search’ to find her, the little business began to grow. The secret was "out of the (garment) bag". 1. FUR IS HOT! : Of course I know that! It is in just about every designer’s 2013 collection in every possible conceived way, from fur covered shoes to full fur coats and everything in between. Women of all ages want it. 2. REUSE, RECYCLE, REPURPOSE: It’s created a trend. Women who have been holding on to their outdated fur coats want to figure out what to do with them or they hand them down to their daughters for them to do with what they want. By meeting with Anne Dee at her studio in the heart of the ‘fur market’, they are pleased to discover that they are able to (as Anne Dee phrases it) “turn what they don’t know what to do with into something they can’t live without.” It could be said that Goldin has gone Green. Her motto is "everything old is new again…or could be made to look new again". She delights in utilizing all of the old fur and offers the possibilities to create multiple pieces from one full length coat. For example: a vest, a bolero, a scarf. More left over? How about fur cuffs? Perhaps a cool-looking fur lined moto jacket or anorak, maybe a chic trench. 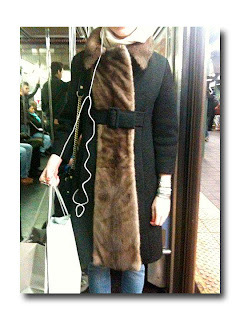 What about reworking a basic mink into a fab horizontally striped ¾ sleeve topper? The options are endless; Anne Dee helps you decide. 3. ECONOMICS: Driven by global demand, the cost of fur skins have reached an all time high. Prices of new furs garments have skyrocketed. It is an enormous savings to utilize one’s own or pre-owned fur and turn into something brand ‘new’. 4. CAPTURING A NEW GENERATION: Anne Dee has noticed a full blown trend among young women, some with enough money to buy whatever they want, opting for vintage and used furs purchased on EBay, on vintage websites, at vintage shows, at thrift shops, at consignment stores, even at yard sales. Like herself, they love the thrill of the hunt and appreciate that they are getting something unique, individual, and almost guaranteed to be one of a kind. (They also like the ‘Green Factor’.) The downside is that many of these pieces, because of their age, are often in need of repair and require some tweaking to make them fit better and/or look more modern. 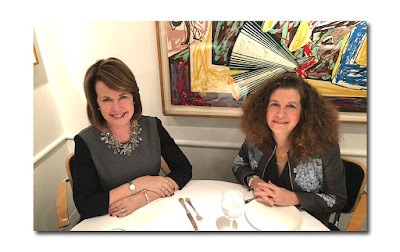 Anne Dee believes that small changes can make big differences and with her astute eye (as I have witnessed her at work at her studio) can spot, for example, that by simply moving the closure higher or further over can change the whole look. She becomes a fur stylist as she hands her own belt to the client and shows the client how to ‘work-it’ on her own fur coat. I HAVE MY 5TH REASON: Anne Dee Goldin is a talent. As she modestly says ‘I am good at what I do’. Anne Dee has always seen herself as a ‘fashion merchant’ not as a ‘furrier’ and it is reflected in the product she creates. She approaches fur coats as outerwear, fur vests as sportswear, fur stoles as accessories. In essence, fur is the fabric, the medium. There is nothing staid or fussy, in its place a sense of playfulness (as if to say "don't take me too seriously"). "Modern yet Timeless" has always been her mantra. Fur-chic is what she delivers. For Anne Dee, it's all about the creative process and the high that comes from the ability to transform and create. Animated and enthusiastic, she truly comes alive when she is in her element. The product she creates is executed with impeccable workmanship and care, thanks to Georgia, a master craftswoman, who works alongside Anne Dee as her "hands". Anne pays great attention to the finishing touches (Yes! God is in the details): distinctive linings, interior trim, natural buttons and nifty closures. It’s a fun process, done together with her clients (many of whom she has formed lasting friendships with) reflecting their personality and spirit. No two pieces are ever alike. Oh, and in just case you're wondering, it's never too early (or too late) to think about your furs. I put mine (all of them vintage) into storage just recently, and as luck would have it, right after doing so, it turned so unseasonably cold, I was sorry I did - LOL. It seems as if this (now past) winter would never end! What I was most excited about, other than getting them out of my apartment, was the prospect of patching them up. ﻿ ﻿More specifically, I have a vintage skunk vest that I have wanted to change a bit, and I also have matching skunk skins. I had several ideas about what I wanted to do. My first thought was to make a scarf or add sleeves to make a coat. But Anne Dee had a better suggestion: to make a separate hood and detachable sleeves. Brilliant. I love hoods, always have. 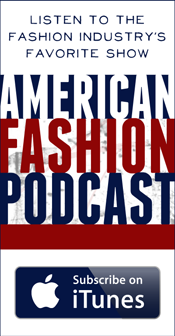 And coincidentally, they could not be more "of the moment" and timely, based on the recent fall 2013 runway shows. I think they are a bit more modern than typical fur hats, and they have that sporty, streetwise edge - which is very contemporary. It’s also fun since the skunk hood is not attached to the vest, I can mix, match and wear with my other outerwear. I can't wait to see the end product and I can't wait for next winter! Anne Dee Goldin is located at 224 West 30th Street and is available by appointment only. For any inquiries call her at 917 282 6626 or email adg@goldin44.com GoldinStyle: Fine Fur Storage and Services offers complimentary courier service. For more information call 212 239 0512 or email info@GoldinStyle.com. 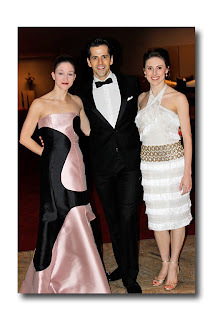 The New York City Ballet held its annual spring gala at the David Koch Theater at Lincoln Center with much hype surrounding the event. Queen Latifah was going to sing and more importantly, this is a critical staple in any New York socialite's busy calendar. The event started off with cocktails and hors d'oeuvres on the terrace of the Koch theater. The crowd was bedecked in jewels and long flowing gowns-this was socialite heaven. The excitement was palpable with most of the crowd familiar with each other from their busy social circuit. 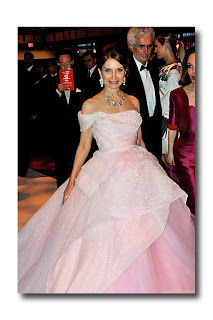 Jean Shafiroff, the reigning socialite, showed up in a stunning pink Oscar de la Renta ball gown adorned by Van Cleef and Boucheron jewels. There were other ladies beautifully groomed in vintage Dior, B. Michael, and Monique Lhuillier floor length dresses. As the bell began to ring, it was time for the crowd to take their seats and for the dancing to begin. ﻿The costumes in the ballet were splendid- with women in pink and purple tutus, men in orange, green and red tights; and one act where the men were in jeans and t shirts with the women in full bodied skirts. While the connection between art and fashion has always been clearly established, the one between ballet and fashion has been rather tenuous. However, over the past years this connection has been strengthened with the help of Valentino, Rodarte, J. Mendel and Nanette Lepore, all of whom have designed costumes for the New York City Ballet. This year Joseph Altuzarra, the French fashion designer, was designing the costumes for two principal dancers, Tiler Peck and Robert Fairchild. 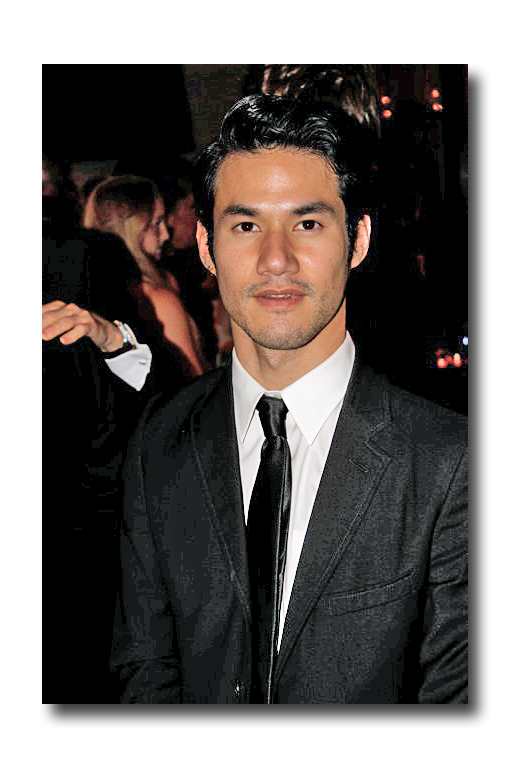 Altuzarra, is a luxury women's ready-to-wear clothing designer who launched his brand in New York in 2008. Mr. Altuzarra, a winner of the Vogue Fashion Fund Award, the FGI Rising Star of the Year Award and numerous other honors, was a perfect choice as he himself danced ballet for eight years as a youngster in Paris. Tiler Peck wore a pale blue crepe de Chine with an asymmetical ruffle on the bottom and Fairchild was clothed in an off white costume with a pale blue underlay. 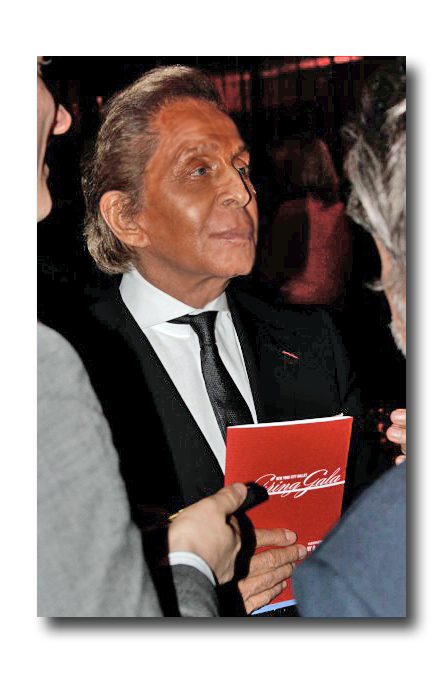 Peck's and Fairchild's costumes were extremely simple and understated in comparison to the voluminous costumes Valentino designed for the last gala. However, the dancers seemed to be more at ease in their movement with these simple garments. Fairchild's off white top was draped over his bodice for which Altuzarra said he was inspired by rehearsal pictures of Baryshnikov and Nureyev in the sixties and seventies. These costumes were elegant and utilitarian-perhaps too practical for my taste. The next act, my favorite part of the night, included Queen Latifah singing "The Man I Love" accompanied by two dancers in a loving pas de deux. This was a crowd pleaser and a moment I will not soon forget-I had no idea Queen Latifah could sing a ballad with such conviction. The costumes of the last dance were coordinated perfectly - with the men dressed as soldiers and the women in blue, pink and yellow tutus complementing the men's attire. The dinner took place in the main dining room with an incredible crowd of luminaries from all walks of life. 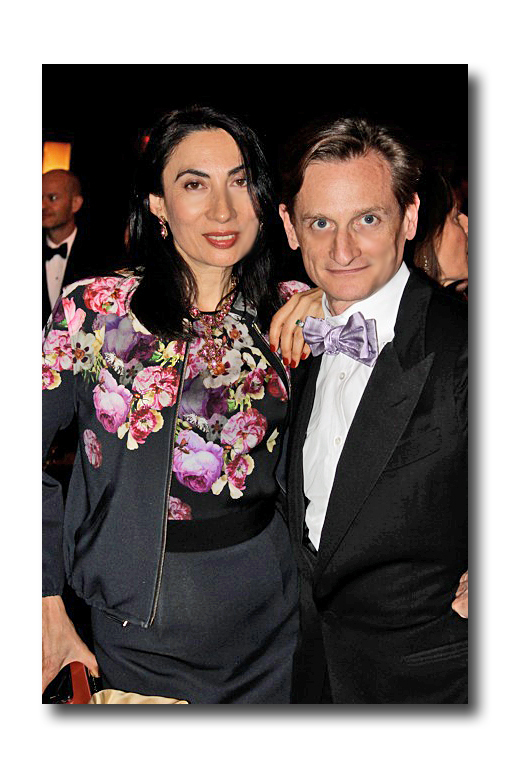 Hamish Bowles, Ann Duong, Lesley Stahl, Valentino Garavani, and Joseph Altuzarra were among the bursting crowd. Valentino said he would love to do the costumes for the Kirov ballet and he really enjoyed designing the costumes for the September ballet gala. Altuzarra said, "it was a great experience to be in the ballet world where it is all about movement, which allows you to think outside the box and not be confined to street clothing." Tiler Peck, echoed this sentiment stating, "I loved working with Joseph Altuzarra because he understands how a piece of clothing works with movement, making it so easy to dance and so enjoyable." At the conclusion of the evening, I was left to contemplate whether the fusion of ballet with designers and musicians was simply a gimmicky way to attract a large crowd or a symbiosis between these creative expressions.